Thousands of research articles now exist on the benefits of glutathione for your body. It’s your primary antioxidant, crucial to health and depleted levels are highly correlated to degenerative disease. Because GSH molecules are used throughout every cell of your body they create the potential to improve multi-system health, from head to toes you will be increasing your cellular health, meaning you improve organ health, system health, and total health. Acting as an anti inflammatory, and oxidative stress reliever glutathione has potential to improve digestion, symptoms of leaky gut and gluten intolerance, and allow your gut to do it’s job of filtering and protecting your health. Mercury, cadmium, and arsenic are all damaging metals when built up int he body. Glutathione can help protect your cells from their damage plus bind to the metals and remove them from your body. The liver benefits of glutathione are tremendous as it is your body’s primary filter and a powerhouse of enzyme reactions. Alcohol damage, viral hepatitis, toxins like acetaminophen can all deplete GSH levels and damage relieved by glutathione. You can even help prevent the influenza virus or THE FLU with glutathione! Traditionally glutathione has been supplemented in medicine via direct intravenous application. These GSH therapies still go on and have therapeutic benefits, but are obviously inconvenient and expensive. The next alternative was to supplement GSH precursors. A high quality whey protein is by far the easiest and best food based alternative. N-Acetyl-L-Cysteine or NAC is the most common clinical precursor used for a quick boost to GSH levels to help relieve acute acetaminophen toxicity in the liver. Oral glutathione supplements were originally known to have absorb-ability issues due to the GSH molecule breaking down in the gut before it ever reaches your blood stream and can provide your molecules any benefit. Though there is now evidence using new measuring mechanisms that suggest even strait L-glutathione supplements absorb better than we ever realized. Absorbing fast through the gut and oxidizing as they pass. Perhaps we can deduce from that, that L-glutathione would provide a very targeted anti-oxidant benefit to the gut upon it’s absorption? There are also two other forms available that have been developed with the intent of increasing absorption and efficacy. Acetyl-glutathione uses an acetyl group with the intent of protecting the molecule through the gut and enhancing it’s absorption through even the blood brain barrier. 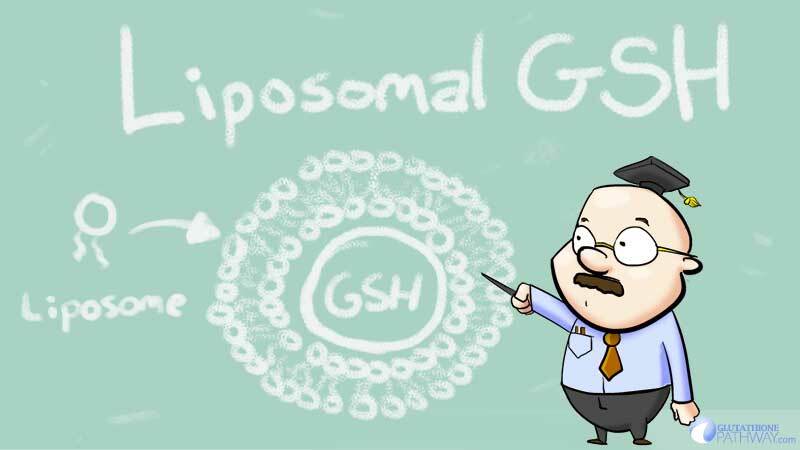 Liposomal glutathione on the other hand wraps the GSH molecule in a lipid or fat so that it can be absorbed safely through the gut and reach the blood stream in tact. The head of each phospholipid is drawn to water, while the tail is repelled by it, These phosolipids can create natural cell walls by arranging themselves in a two layered sphere around a cell the heads facing outwards the tails connecting to each other and then the inner lipid ‘heads’ holding the glutathione molecule. In fact liposomes have been used to transfer vaccines, medications, even transfer of DNA to targeted cells. As discussed, there are numerous potential health benefits to optimizing glutathione levels. It’s anti-aging benefits alone may not be EXACTLY a fountain of youth, but might keep you healthier longer and into older age. The double walled lipid structure that surrounds the GSH molecule should protect it while travelling through the stomach and allow it to be absorbed through the epithelial tissues. Presently we believe that liposomal glutathione, and acetyl glutathione are the two most sure-fire oral GSH supplements available on the market. 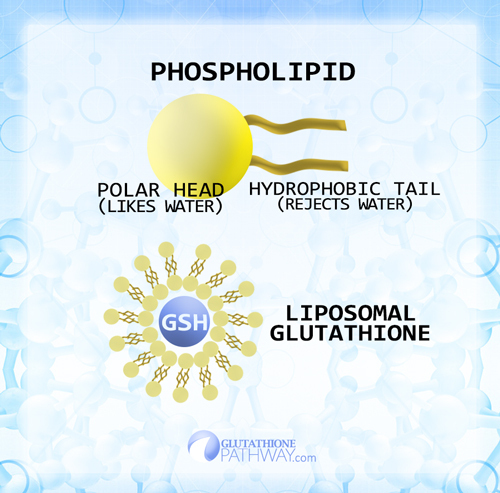 So… YES Liposomal Glutathione should safely and effectively raise your GSH levels. Both should effectively absorb through the stomach and are well positioned for delivery through cells. Acetylation is common in pharmacy and is known for improving absorption into the brain specifically, so acetyl-glutathione may have an edge in that particular department. Either type of glutathione you choose, acetyl or liposomal, you should FEEL the difference to your health. We will be reviewing the current market for the best Liposomal glutathione brands available, and will be sure to list and link them here. Please share any experiences you’ve had with Liposomal Glutathione in the comments below!